For your convenience, we have saved our Formwork Accessories Catalogue as a PDF File that you can download and view using Adobe Reader software. You may download information on any of our product range by downloading the PDF file. The PDF file can be opened using Adobe Reader 5.0 or higher. You can also download Adobe Reader by clicking on the Icon (Get Adobe Reader), it's free. These PDF file needs to be saved to disk. Please right-click and select 'Save Target As' or simply download. The decking beams are designed with a very wide top flange thereby reducing maintenance costs by increasing the lifespan of the plywood. The decking beams are available in all the standard sizes, but any special sizes can be constructed for a nominal charge. Thread Size 15 mm Dywidag Thread. Min. Load 90 KN. Sizes: 118 x 105 x 44 Min. Slip Load: 3.5 Kg. Sizes : 36 mm, 70 mm & 100 mm. Thread Size: 15 mm Dywidag Thread. 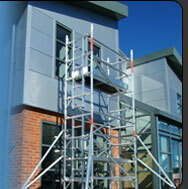 Heads can be installed in to either a prop or scaffold tube. This unit provides up to 350mm of adjustment.